Life insurance, also known as term life insurance or death insurance, provides a cash lump sum in the event of death. Most policies will also pay on the diagnosis of a terminal illness with less than 12 months to live. Life cover normally applies immediately for any cause of death, whether accident or illness, with the exception of suicide occurring within the first 13 months. For those not eligible for full life cover there are limited Accidental Death or Accident Only Life insurance policies available which only cover death resulting from an accident. Premiums generally increase each year as you get older (i.e. are stepped), however level premiums are also available. Total and Permanent Disability or TPD insurance is usually purchased as an optional extra on a life insurance policy and covers against a permanent disability arising from illness or injury which prevents you from ever working again. Usually Life and TPD insurance covers are linked so that you are paid a cash lump sum on the first of death or TPD to occur. The amount of TPD cover is normally limited to the amount of life cover purchased, although standalone TPD insurance cover can be purchased separately if life cover is not required. The cost of TPD insurance cover will be higher if you work in an occupation which requires manual work. Commonly claimed TPD conditions are back injuries and mental illnesses. Why do I need Life and TPD insurance? The purpose of life insurance is to protect your dependants from financial loss in the event of your death. The proceeds of the policy can be used to repay debts, pay for funeral costs, pay for future education costs and replace future income lost. Term life insurance is very economical cover, particularly if taken out while young and healthy. TPD insurance protects both you and your family from financial loss in the event a serious and permanent disablement prevents you from working again. In this case your family has to continue to meet living expenses and debt obligations without your income and they may also have to pay for any costs associated with your disability such as medical fees, home modifications and ongoing care. TPD insurance will provide a lump sum which you and your family can use to repay debt and/or draw down on over time. TPD insurance does not cover temporary disabilities or trauma conditions where you are able to eventually return to work – these are covered by income protection and trauma insurance policies. If you have an income protection policy with a benefit period to age 65 you may be able to have a lower amount of TPD insurance as 75% of your future income will be covered if you are permanently disabled. Your individual circumstances will determine which covers are a priority for you. The main factors affecting the cost of Life insurance are: age, gender and smoker status. 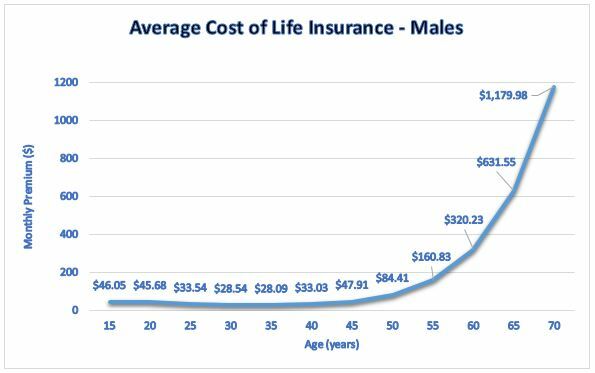 Below we show the average cost of Life Insurance for males and females at different ages based on $500,000 Life insurance cover and non-smoker rates. The premiums shown are the average of premiums from the following insurers: AIA, AMP, Asteron, BT, ClearView, CommInsure, MLC, OnePath, TAL and Zurich as at 27th August 2018. From these graphs it can be seen that females enjoy much lower life insurance premiums than males, mirroring the different mortality rates for males and females. The median life expectancy for females is 84 years of age compared to 78 years of age for males. 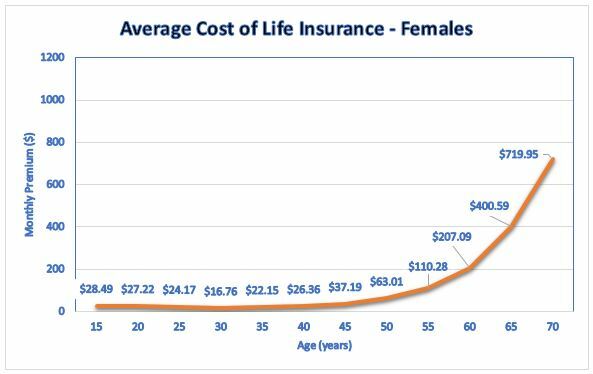 For both females and males, average life insurance premiums decrease from mid-teens until early 30s as the risks of motor vehicle accidents and self-inflicted harm reduce. Thereafter the increasing incidence of deaths from health conditions such as cancer and coronary heart disease cause premiums to rise gradually until the age of 50, after which premiums rise sharply. A level premium can help to smooth out the age effect of rising premiums. A level premium taken out while in the early 30s and held to age 65 or 70 can result in significant premium savings compared to a stepped premium (which increases with age). Premiums for smokers can be as much as double the rates shown. Occupation can also be a factor resulting in a higher premium if your job is judged to be hazardous by the insurance company i.e. you work at heights or handle explosives. Also there are some pre-existing medical conditions (including a high Body Mass Index) that can result in the insurer imposing a “loading” or higher premium when assessing your application. How much Life and TPD insurance cover do I need? Your need for insurance will vary at different stages in your life. When you are taking out a mortgage or having children your family’s finances will be vulnerable to a loss of income due to unexpected illness or death. On the other hand, as you approach retirement you are more likely to have accumulated assets, including superannuation savings, and paid off liabilities and your children are more likely to have left home. This can mean that your need for life or permanent disability insurance is reduced. Our Life Insurance Calculator is an illustrative tool which can help you to estimate your current and future obligations and estimate your need for cover. Your insurance needs will vary over time and should be reviewed at least annually. Can I have multiple Life and TPD insurance policies? It is possible to have multiple Life and TPD insurance policies. Many people will have automatic Life insurance and TPD insurance cover provided by their employer or superannuation fund and may also have other policies they have taken out personally. The policies may have been taken out for different purposes and/or have different beneficiaries (e.g. for estate equalisation purposes). Some people prefer to diversify their cover across several different insurers, although this will usually cost more than consolidating with one insurer due to the discounts provided for larger sums insured. In the event of your death or disability claims can be made against all valid policies. However you need to ensure that when you are taking out a new policy you disclose any existing policies. This is so that the insurance company can assess your application against their maximum cover limits (see below). What is the maximum Life and TPD insurance cover I can have? While the major life insurance companies compared on this website have no absolute limit on the amount of life insurance cover an individual can apply for, there is usually a limit of $5M for total TPD cover (lower limits may apply on products marketed direct to the public). If your insurance needs are higher than the amounts implied by these multiples this does not mean that your application will be refused. You may however be requested to provide more information about how you determined your cover amount. This may include details regarding your current level of debt, number of dependants and their age, your income and the income of your spouse (which may be affected by your death or disability if, for example, they are required to care for children). If you do not have an income because you are not working or you are performing home duties you can still apply for life and TPD insurance, however cover limits may apply. If you are not sure how much cover you need you can use our Life Insurance Calculator to estimate your requirements. Will my Life insurance or TPD insurance claim be paid? A review by ASIC in 2016 found that on average approximately 90% of all claims submitted were paid – of these 96% of life insurance claims and 84% for TPD insurance claims were paid. The main reasons for declined claims were non-disclosure at time of application and ineligibility due to policy definitions, limitations, exclusions or pre-existing conditions. In March 2019 APRA and ASIC released for the first time claims acceptance rates and average claims times on an individual insurance company basis. Insurers who are under performing industry averages for processing claims will now be accountable to both consumers and the regulators. If you have taken out a Life/TPD insurance policy through Insurance Watch and you need to make a claim we will help you during the claims process. The initial sum insured may be eaten into by inflation as time passes. Most companies allow escalation of the benefit in line with inflation or a set percentage increase without the need for further medical examinations or paperwork. The increase in the benefit each year is optional and can be refused. What appears to be a cheap premium today may turn expensive if the insurance company you are with penalises older age groups more than other companies. Some companies offer discounts to new customers but after the first year or two these drop off and you can find yourself on a higher premium. Other companies offer loyalty discounts, which can make the overall cost over 5 or 10 years significantly less. Using the Compare Insurance Quotes Online feature of this site, you can graph the current premium structures over 5 years and compare the competitiveness of the policy over the longer run. Beware the so called “cheap” offers of insurance which are advertised heavily. Remember the size of the premium varies directly with the amount of cover taken out. Small premiums usually mean small amounts of cover eg $50,000 to $100,000 which in the event of your death may be grossly inadequate to meet your family’s needs. To compare like amounts of cover from all the leading insurance companies use the Compare Insurance Quotes Online feature. Your superannuation fund may include automatic cover for term life or TPD disability insurance up to a certain amount. However this default level of cover may be inadequate for your needs and in some cases the amount will reduce as you get older. The super fund may offer a facility to “top-up” your cover for an additional cost but this may require underwriting of your health. Due to the “pooled” or group nature of this form of insurance, the default premium charged will generally favour the older members of the Fund or those with pre-existing health problems who would normally be penalised by life insurance companies. Healthy, younger members are in effect subsidising these groups and may find purchasing cover as an individual from an insurance company to be more cost effective. Other issues to consider are: potential delays in the payment of claims, the right of the Trustees of super funds to override your choice of beneficiary and the lump sum tax which will apply to any payout where the beneficiary is not a dependant (unlike for an insurance company payout). These and other issues are considered in our list of potential disadvantages of superannuation insurance compared to policies outside super. Of course, if you are self employed or run your own Self Managed Super Fund (SMSF) you will need to ensure that insurance is part of your business planning. Check the terminal illness section of your life insurance policy. Does the company offer early payment of part of your benefit in the case of the diagnosis of a terminal illness? This could significantly improve your quality of life and ease the burden of medical bills and other commitments on your family prior to your death. Own Occupation – You will be paid if by reason of accident or injury you are unable to work ever again in your own or normal occupation. Any Occupation – You will be paid if by reason of accident or injury you are unable to work ever again in any occupation for which you are reasonably suited by education, training or experience. “Own” occupation definitions are generally preferable given that an injury such as loss of one hand may disable a surgeon under such a definition, but under an “Any” occupation definition may leave him able to perform the duties of a GP at a much reduced income and therefore not qualify for the benefit. However the “Own” occupation definition is more expensive and may not be available for all occupations. Some companies offer other “home duties” and “modified” definitions of TPD. Usually only ONE TPD benefit is ever payable to an individual and payment of a claim for TPD will usually void your linked death cover. After a payout you may become uninsurable and no longer able to obtain life insurance, TPD insurance, trauma insurance or income protection insurance insurance cover from any insurer. In this case it is important to have sufficient cover to enable you to live out your remaining life on the proceeds of the claim. Some insurers offer a TPD buyback option (this may be included at no cost or require an additional premium) which enables the death cover to be reinstated twelve months after the TPD claim.